MOBILE DEVICES WILL DESTROY YOUR BUSINESS (AND LIFE) –HERE’S YOUR PLAN? 29% of cell owners describe their cell phone as “something they can’t imagine living without”. Nearly 1/3 of all cell phone users can’t imagine living without it! Not sure about you, but I’m reminded of Aldous Huxley and how he predicted the day will come when men and women are ruled by machines. 2012 was a very unusual year in the PC market. For the first time since 2001, PC sales were projected to be lower than they were in the previous year. So which devices are consumers buying? Tablets, for one thing. Tablet sales are expected to exceed 100 million units this year. Their sales numbers may exceed laptop sales this year. Despite this shift, PC’s still dominate the workplace. 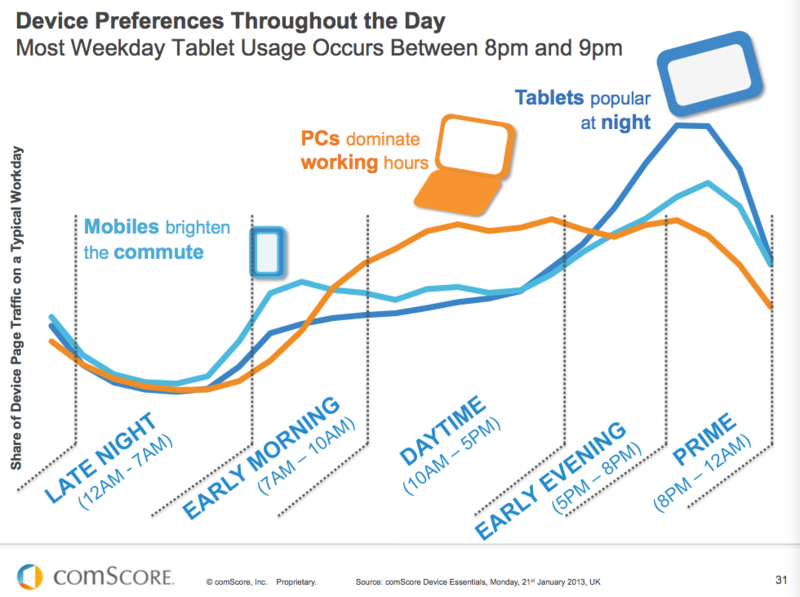 comScore tracked site visits by type of device (mobile, pcs, & tablets) and their study revealed that outside of the workplace, mobile devices and tablets dominate the web. comScore also monitored the year-over-year increase or decrease in traffic, based on type of device, for the most visited websites. They discovered a 75% increase in traffic from mobile devices. Compare that with the 9.4% increase in traffic from PCs. 60% of cell phone owners say they use their phones to go online to browse the internet, exchange emails, or download apps, according to Pew Research. Don’t let 60% fool you as a small percentage. That 60% represents over 175 million Americans. So what are all those people doing when on their phone? 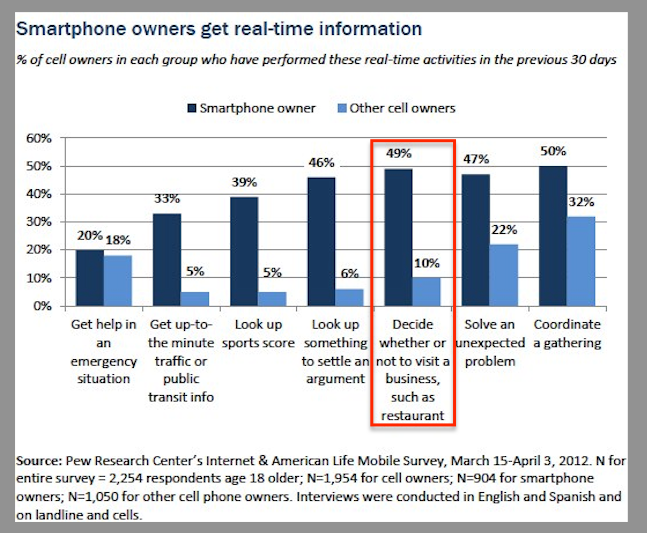 49% of smartphone users used their phone to decide on whether or not to visit a particular business. Less than 10 years ago, these people would have likely given your business a try. But today, thanks to this magical device they can’t live without, they trust it to determine whether or not they should even visit your business. No longer do you have the chance to at least get them in the door and then sell them. No, today they let their smartphone make the decision for them. As an entrepreneur, you can’t risk ignoring this trend. It’s your responsibility as the leader of your organization to study the trends, to know and understand the impact they will have on your industry and your business. OKAY, BUT IS THIS MOBILE THING JUST A FAD? A fad? No. If anything, this is a trend. Sure, trends move up and down, but mobile is an upward trend – and will only continue. Consider the staggering increase in the amount of time people spend on their mobile devices (not talking) from 2010 through 2013. In 2010 the average per day was 24 minutes, and in 2013 it jumped up to 2 hours and 21 minutes. That’s a 487.5% increase in the time spent each day on a mobile device, not including the amount of time making phone calls. 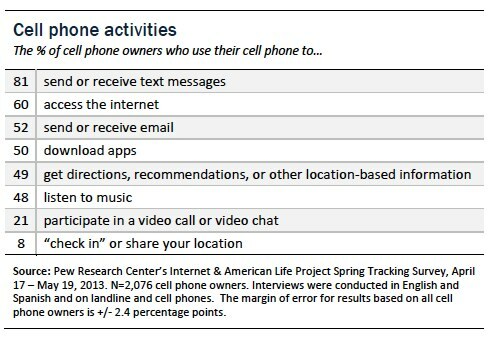 Almost half (46%) of teens in the United States are online for more than ten hours each daily…the majority of these hours spent on mobile devices. Boomers age 45-66 and seniors 67+ now spend more time online than they do watching television. In an average week, they spend 16 hours watching television and 19 hours online. 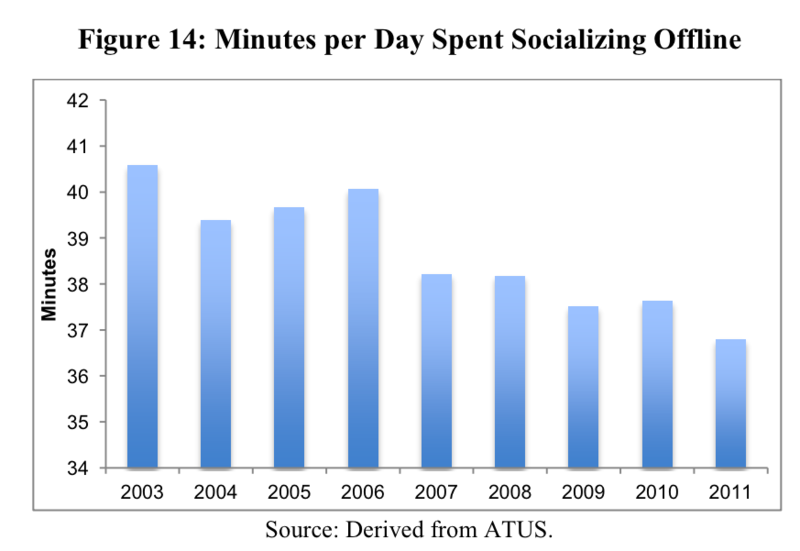 As a result of more people connecting, socializing, engaging, and shopping online, people are spending less and less time in real face-to-face socializing. This again ties into the other stats showing that more and more people are trusting the opinions, ideas, and recommendations that their little mobile device gives them – accurate or not. Not that long ago Wal-Mart was viewed as a disruptor. When the department store chain would build in a new market, all of the smaller businesses would cry out that their was no way they would be able to compete with Wal-Mart’s “always lower prices”. And in many respects, their statements became a self-fulfilling prophecy and today they are no longer in business. Amazon has 182 million active customers. Over 10 million people are enrolled in Amazon’s $99 per year PRIME program. All of these make it easy for Amazon to disrupt your industry and marketplace, and also validate the mobile trend. As always, action is optional. No one is going to require you to learn how to leverage these trends in your business. Thanks, in part, to mobile devices, the market doesn’t care if your business is mobile friendly. In large part, they will use their mobile devices to find other companies providing similar products and services that make it easy for them to connect and do business within the mobile world. My intention isn’t to be harsh, but simply honest. As you know, the business landscape is constantly evolving. What worked yesterday likely won’t work today. Today more than ever, those who can and will disrupt your business are aggressively working to do so. 1) Don’t Ignore the Trends. It would be very easy to simply brush off this trend, throw your hands up and say, “There is nothing I can do.” As an entrepreneur it is your duty to lead not only business through these trends, but to also help your customers navigate the ever changing landscape. Spend some time identifying things you can do specifically to engage people through the web. Look for new opportunities to create meaningful dialogs with your customer and prospect base. One of the masters of this is Brian Goulet, and his team at The Goulet Pen Company. Be a rebel. Take Richard Branson’s approach and choose to deliberately go against the trends. When he launched Virgin Atlantic the airline industry was in shambles. Profits for all the major airlines were virtually non-existent. The future of the industry looked bleak, with no foreseeable change in the direction it was heading. As a result customer satisfaction was at an all-time low; the statistics which ensued lead Richard to go against the trend and launch Virgin Atlantic. Look around at the assets that you currently have and identify ways that you can further leverage those assets. If you have a website, is it mobile friendly? If you are using social media, what can you do to further engage people in meaningful dialogs? What ways can you help lead your customers through the trends? How can you position yourself as the place to go regardless of what is happening in the broad market? Something, or someone, is constantly fighting for the attention of your customers and prospects. It is your, and my, responsibility to defend our position within the minds of our market. As our culture continues to make the shift to a more mobile and digitally connected world, without a clear strategy you and your organization are stuck reacting to what is happening. You can count on the fact that somewhere in your market, one of your competitors has an aggressive plan. And more than likely, their plan includes the removal of your business from the marketplace. What’s your plan? -Which of my marketing or sales efforts brought in the majority of my sales or clients? -Do I test the various aspects of my marketing and selling activities to make sure they’re producing the best and most profitable results? -What does it cost me to acquire a new customer? -After the initial sales, are there systematic methods to communicate and resell to by clients? -Who are my biggest competitors and what do they offer that I do not? -What steps do I take to offset their advantage? Are they working? -Do I view marketing as an investment or as an expense? -Do you regularly study the most successful websites? Here’s the anatomy of a million dollar website.